New York City, Las Vegas, Orlando, San Francisco, Washington, Los Angeles, we have all dreamed of visiting one or several of these cities. The USA is home to some of the most thrilling and diverse cities or towns in the world. Just about any imagined holiday can be experienced somewhere in this great land, from hip and urban metropolises, to quaint hidden streams, gigantic canyons landscapes, or minuscule towns brimming with culture. And the people are just as varied and fascinating to meet, with each having a rich and unique story to tell. 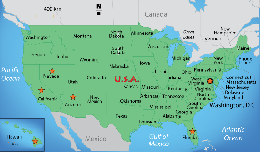 Some of the top sites and destinations offered in this great country include the Statue of Liberty in New York City, Arizona's Grand Canyon, the French Quarter of New Orleans, Florida's Gold Coast, the Hollywood sign of Los Angeles, Mount Rushmore in South Dakota, the exotic islands of Hawaii, the famous Las Vegas Strip, the Rocky Mountains and the living history and memorials of Washington, D.C. The choices are simply enumerable; you are only limited by the time of your stay.